This concept draws largely from the American Association Milwaukee Brewers, a powerhouse for fifty years and Milwaukee's first great baseball team. From 1902 through 1952 they were dominant in their league, and it was that success that paved the way for the Braves to move from Boston in 1953. Many baseball greats from Al Simmons to Johnny Logan to manager Casey Stengel to owner Bill Veeck got their start with the "Brews," and many older Milwaukeeans still remember the days of Borchert Field. When Bud Selig founded his organization to bring a major league team to Milwaukee, there was no question about what the team would be called. This concept honors that tradition while brigning the Brewers squarely into today. Baseball is the most traditional of sports, with a long and cherished tradition, and a team's look should reflect that. 3. The Beer Barrel Man logo. 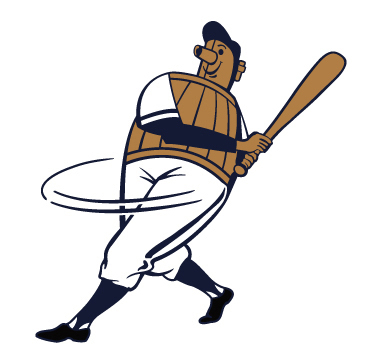 The Beer Barrel Man logo is synonymous with Milwaukee baseball from the American Association team to Hank Aaron's final playing days. Not only does the Beer Barrel Man link to that tradition, but it also provides the team with the opportunity for a mascot logo, which has been very successful for the Reds and the Mets since they re-introduced their mascots (for more on the Beer Barrel Man and his history, click here). 4. A clean, solid design that is both contemporary and classic. The simple wordmark appeals to the timeless nature of baseball, while the dark, classic colors are very popular with fans and the general public. The piping allows the team color to shine through. The lack of names on the back signifies a return to tradition (names are a relatively new addition to the Brewers uniform, not being present on Hank Aaron's back or Robin Yount's when he smacked his 3,000th hit). 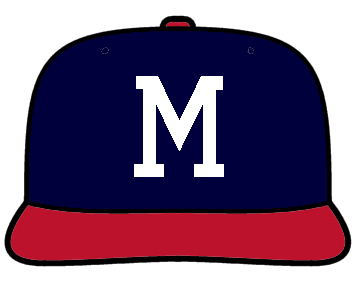 originally worn by the Brewers of the American Association of the 1940s, this cap was adopted and made famous by the Milwaukee Braves. It's time to bring this cap home. the symbol of Milwaukee baseball for fifty years, the Beer Barrel Man is re-envisioned for the 21st Century. He always swings for the fences! 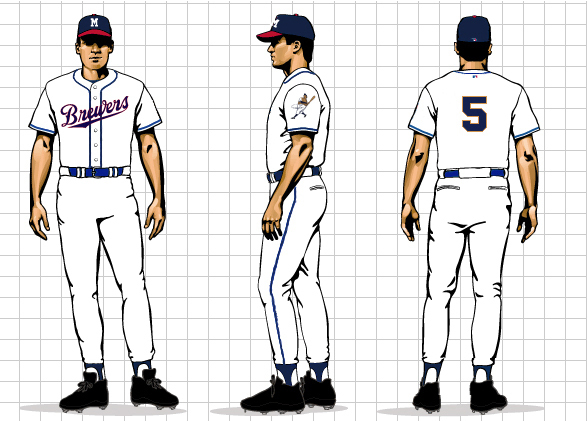 The "NEW CLASSIC" concept incorporates the best elements of the Brewers' past in a uniform concept determined to lead the club into a bright future.